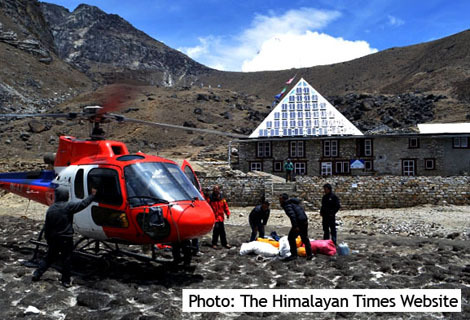 Italian duo airlift rubbish from Everest Camp 1 to Pyramid – Summit Helicopters Pvt. Ltd.
An Italian pilot, who flies Fishtail chopper, and another Italian national, who works at the Pyramid International Laboratory/Observatory on the lap of Mt Everest, brought some materials and rubbish left at the Camp 1 to the High Altitude Research Center for storage and proper disposal today. According to GP Verza of the Center, Captain Maurizio Folini had sought his help to collect and dispose various materials and rubbish apparently left by the expedition teams that either became victim or witness of the April 18 avalanche. The Center, which is jointly managed by the Ev-K2-CNR Committee and the Nepal Academy of Science and Technology (NAST) since 1990, is located at 5,050 m in the Khumbu Valley in Solukhumbu district. The Center provides a platform to conduct research on environment, climate, human physiology and geology in the area. mountains. “Release of fuel like kerosene would impose bad effects on environment and it would contaminate water in the lower areas in the days to come,” he wrote an email sent to THT Online. He further pointed out there are higher chances of crevasse formation in the Camp 1 due to such disposals. Posted in: Company News, CSR, Tourism Articles, Tourism News.